Penn State defensive ends Shaka Toney (left) and Shareef Miller. STATE COLLEGE, Pa. – Shareef Miller is from North Philadelphia. Shaka Toney hails from West Philadelphia. Both were outstanding high school football players; Miller at Frankford and George Washington, Toney at Imhotep Charter. 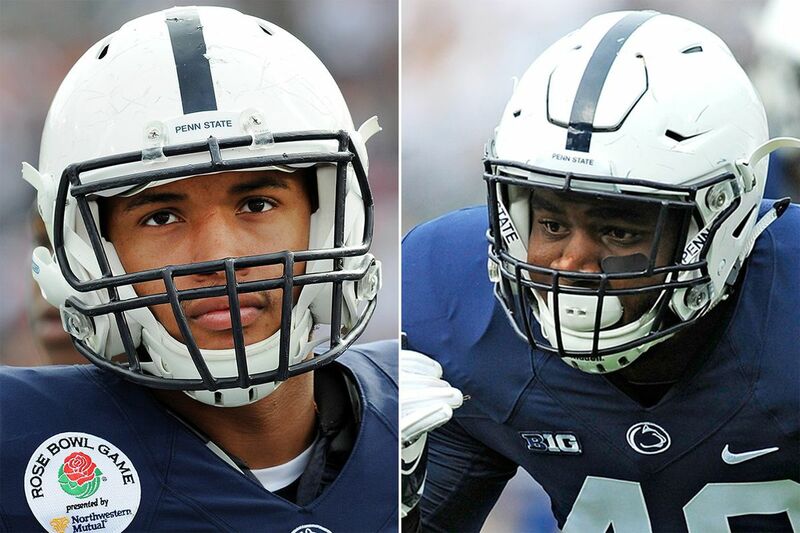 Together, they are part of the mix at defensive end for Penn State, where several candidates are competing for two starting jobs in training camp. The two players met a few years back while in high school, introduced by a teammate of Toney's. It sounded a little tense at first, with Toney recalling, "We were just staring at each other for a good couple of minutes." "Then he eventually stuck his hand out and said, 'I'm Shareef,' and I said, 'I'm Shaka,' and we've been cool ever since," he said. Shareef Miller answers questions during Media Day. Miller is a year older and a year more experienced in the ways of head coach James Franklin and Nittany Lions football, and has reached out on occasion to offer guidance to Toney. The redshirt sophomore told Toney that the love coaches showed him in recruiting would end, and they would be harder on him in practice to get him to learn the Penn State way. "I told him how it was," the 6-foot-5, 255-pound Miller said at Saturday's media day. "I told him it ain't going to be like it was during recruiting. They're going to coach you here. They're not recruiting you no more. I was ready for it when I got here. That's what coaching is for." But Toney didn't quite see it quite that way. Having redshirted his first year, as Miller did, he found the support from coaches and teammates to be strong and sincere. "I can't say that they ever stopped loving me," he said. "The support that I have is just amazing. They made this process amazing. It's so much easier to deal with that because of the fact that there's so much support around here." The two Philadelphians have attracted praise from their head coach as they vie for starting jobs and roles in the defensive-line rotation. Franklin called Miller "a guy that has a chance to kind of have a breakout year and take that next step." As for Toney, the head coach said the player's lack of size for a Big Ten defensive end is not an issue, and told his coaches to "watch him in the pass game, [he's] on his third step before the offensive tackle is taking his first." Toney is listed at 6-foot-3 and 218 pounds although he will readily tell an interviewer, "I'm in the 220s now." But he has run a 4.54 time in the 40-yard dash, best among the defensive ends, and has a vertical jump of 38 inches, second on the team. "My coaches and teammates reassure me every single day," Toney said. "The media and people are saying I couldn't play this position. There was a lot of doubt, but they assure me every day that I'm going to be a dominant player in college football. So it was a process and I persevered through it and I'm going to keep working to get better every day." Shaka Toney poses for a photo during Media Day. Miller likes what he saw of Toney at spring practice, and now in training camp. "He's doing real good," Miller said. "He grew a lot since the spring, especially with the plays. He's real crisp with the plays. He's always asking questions. It's going to be real good for him. I'm excited for him, actually." And as for size, "Yeah, I think he's big enough," Miller said. "Obviously everybody looks at him and he's not 250, 260. When I see him at practice, he's able to bang with those guys, and he uses his speed." Miller uses a mix of power and quickness. He made an auspicious debut last season with two sacks in the season opener against Kent State, and finished the season with 5½ tackles for loss and a forced fumble. While the defensive-end competition is fierce, the camaraderie among the candidates is strong. "We're truly brothers," Toney said. "I love these guys, and I'm going to do what it takes for every single one of them. It's a crazy blend of people. We're all a little bit of crazy but it's the best kind of crazy, because it all brought us together."